What is the difference between mobile home plumbing and plumbing in a site built home? There are some significant differences in the plumbing system of a mobile home that are a result of the method of manufacture. Mobile homes are not built to the same standards as site-built homes since they fall under different regulations. This accounts for some of the differences in the plumbing systems. Also, since a major appeal of mobile homes is affordability many materials tended to be on the lower end of both cost and quality. While the quality of materials used in newer mobile homes is much better than the older ones built in the ’60s '70s and '80s there are still differences in types of plumbing materials used and in the plumbing systems. Knowing the differences is important when dealing with plumbing problems and when considering renovations or upgrades. A very noticeable difference is the piping materials used. Instead of copper water pipes, most mobile homes are built with plastic pipes. Often plastic pipes that were never approved for use in site-built homes were approved for mobile homes. Unfortunately, some of those pipes were prone to get a lot of leaks over time. Newer mobile homes usually have CPVC or PEX tubing which will last as long as or longer than copper pipes in many cases, so those with the newer style pipes or those that have been re-piped need not worry. The location of pipes and how they come into the house is also different. Instead of the water lines coming out from the wall many pipes come straight up from the floor. This usually does not look quite as nice but will serve the same purpose and works the same way. Keep the pipe location in mind when changing plumbing fixtures in a mobile home. Sink cabinets need to have enough space to allow for the water pipes to come up. Also, when connecting water lines it may be necessary to use straight stop valves instead of angle stop valves. 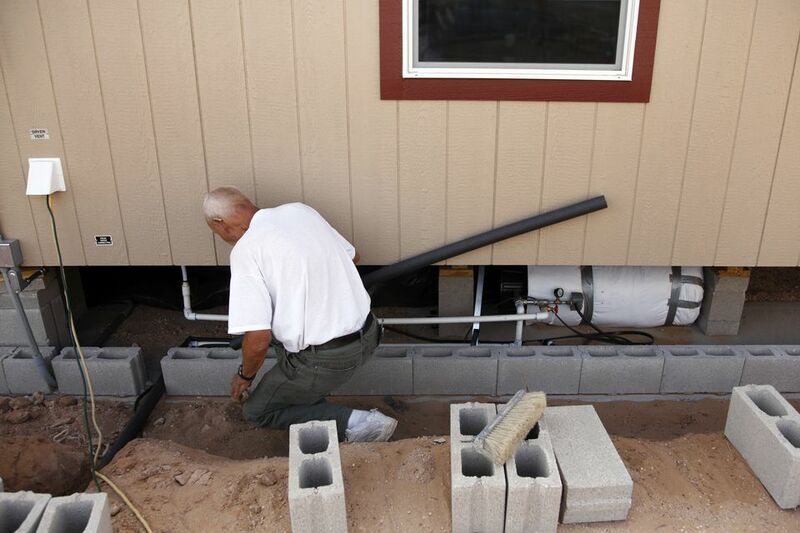 Venting of drain pipes is another instance where mobile home plumbing is different. In a mobile home, many tubs lack an overflow, which is a great clean-out for snaking the tub. Also, sinks sometimes do not have a vent or have an under-the-counter vent which works well, but doesn’t look quite as nice. Even kitchen drains usually just have an under the counter vent in mobile homes. The space needed for an under counter vent is another thing to keep in mind when replacing fixtures in a mobile home. Clean-outs in mobile home plumbing can be an issue as well. Most site-built homes have kitchen clean-outs, mainline clean-outs, and even washing machine clean-outs that are used to clear a sewer line clog. In many cases, mobile homes do not have any clean-outs. This can make it more difficult and expensive if you get occasional sewer drain line stoppages. The good thing about mobile homes is that they are usually easy to work on. In many cases, water lines or drain lines can be upgraded if they are of lower quality. Working on mobile home plumbing can often be less expensive than working on site-built homes.